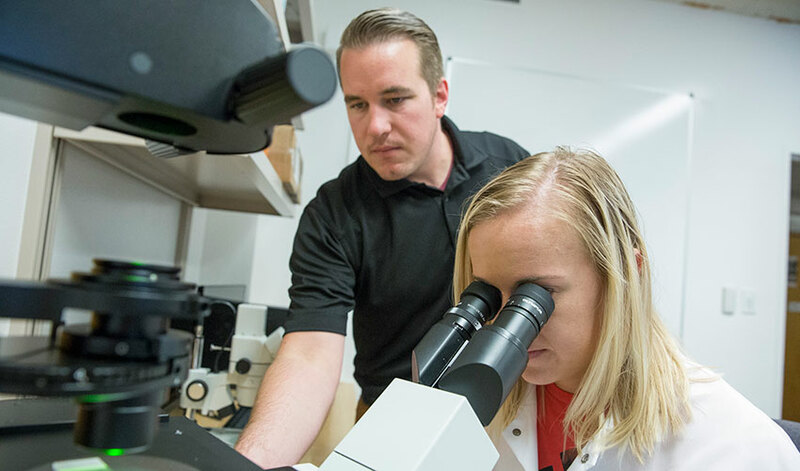 SF State graduate student Kaylie Marsh and Assistant Professor of Kinesiology Jimmy Bagley look at muscle tissue samples taken as part of a study into the effects of weightlessness on muscles. If NASA ever sends humans to Mars, who would go on the mission? And how would they maintain their health over a six-month journey? An exploratory study done by San Francisco State University kinesiology graduate student Kaylie Marsh found that the muscles of female astronauts could fare pretty well during a prolonged spaceflight. Marsh’s research was aimed at helping develop exercise countermeasures to prevent muscle atrophy in low gravity. NASA officials and researchers have been looking into how to keep astronauts in good physical shape in a weightless environment where muscle and cardiovascular function can become significantly diminished because of low gravity. Astronauts on the International Space Station have used a special treadmill, a stationary bicycle and a large device that simulates weightlifting to prevent this. To save space, NASA engineers have also developed one machine that allows astronauts to do both aerobic and resistance training, or concurrent exercise. Marsh’s study looked at how participants responded to exercises that combine cardio and strength training in simulated microgravity. She used muscle tissue samples taken in a previous study undertaken at California State University, Long Beach by a colleague of SF State Assistant Professor of Kinesiology Jimmy Bagley. In that study, funded in part by the National Space Biomedical Research Institute and the National Institutes of Health, eight men and eight women used crutches to get around and wore a shoe with a one and a half inch sole. The other leg was left dangling for 10 days, Bagley said. Marsh analyzed the muscle biopsies taken before and after the 10-day period. That’s when she saw the surprising results among the female participants. Of the 537 astronauts who have traveled to space, just 60 have been women. Also, most past studies in microgravity have used only male subjects, according to Marsh. Marsh says the analysis could act as a framework for future investigations into identifying effective exercise regimens for female astronauts during spaceflight. She plans to submit her findings to the American College of Sports Medicine and hopes to publish the research by next year.